A South African appeals court overturned Oscar Pistorius’s previous conviction on lesser charges in the death of his girlfriend, and found the Olympic sprinter guilty of murder, which could carry a sentence of at least 15 years in prison. The judgment was unanimous from the five justices presiding over the case at the Supreme Court of Appeal in Bloemfontein, and Judge Eric Leach, in announcing the verdict, took a moment to marvel at the scope of the tragedy. Pistorius, 29, shot and killed Reeva Steenkamp in their Pretoria home on Feb 14, 2013, firing through a closed bathroom door. At his trial in 2014, Pistorius testified that he believed she was a burglar. The trial judge found him guilty of culpable homicide, a lesser charge than that sought by the prosecution, one akin to manslaughter. Pistorius spent a year in prison, and is currently serving house arrest and performing community service. While the appeals court said that Pistorius’s testimony was inconsistent, the basis for its ruling rested upon a South African legal concept called dolus eventualis—roughly, whether Pistorius should have been aware of the potential result of his actions, whether he intended that result or not. At his first trial, the judge ruled that dolus eventualis did not apply because Pistorius did not know Steenkamp was in the bathroom. That ruling was the basis of the state’s appeal, and the judges today agreed, saying that Pistorius should have known someone behind that door could die if he fired into it, no matter who it was. Murder in South Africa carries a minimum of 15 years in prison, though a lesser sentence can be imposed under exceptional circumstances. 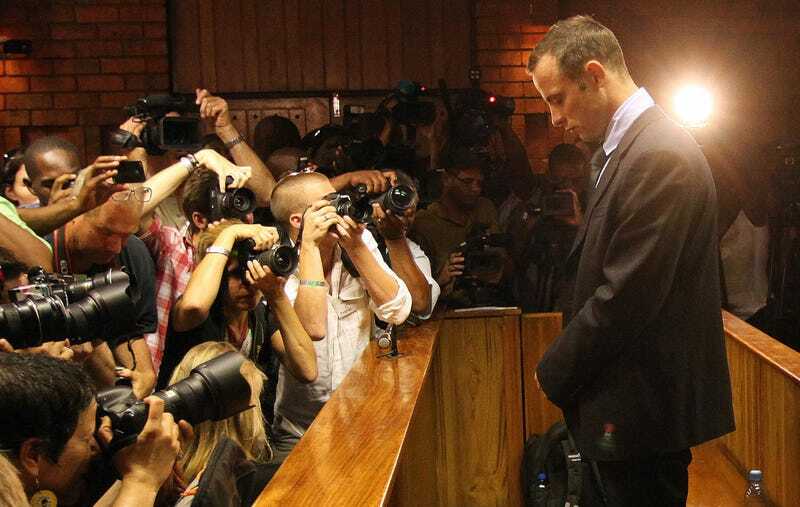 No date for Pistorius’s sentencing hearing has been set, and he is expected to remain under house arrest until then.